ATTLEBORO — Cooks who favor organic ingredients in their salad could be getting their next batch of bean sprouts or lettuce from an indoor farm. Friends and health food enthusiasts Ashley Driscoll of Seekonk and Brad Rao and John Irving of Attleboro have teamed up to raise thousands of sprouts, herbs and starter seedlings of lettuce, tomatoes and other produce in an unexpected place — the top floor of a 19th century jewelry factory on County Street. The entrepreneurial trio and several employees and volunteers began growing plants from seed in December. They aim to sell trays of locally grown seedlings this spring through farmers’ markets and commercial garden and health food stores. They also have other big plans, including opening their own outdoor farmer’s market and eventually processing wheat grass and other greens for commercial sale. There’s also talk of an organic food restaurant. 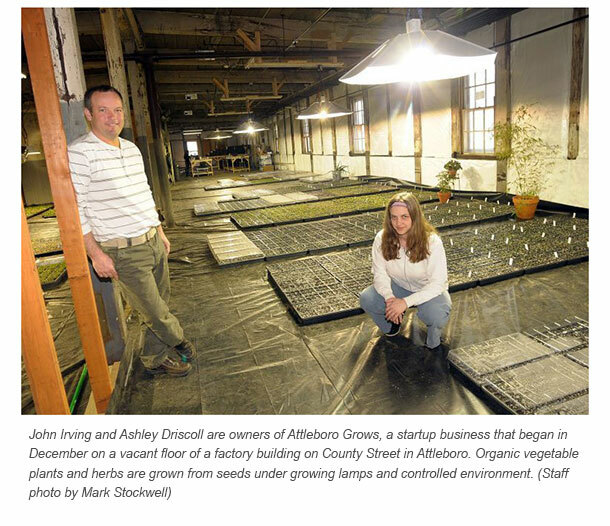 Driscoll and company are calling their business Indoor Organic Farm of Attleboro, and plans to raise vegetable and fruit seedlings for sale to gardeners on a seasonal basis. They’ll grow sprouts and other crops year round to supply health food stores and other retailers. IOF already has a contract with a Boston garden retailer to supply thousands of trays of plants. Driscoll, who serves as president of parent company Bridge Organics, said the business is a result of consumers’ growing awareness of healthy foods grown from natural soil without the intervention of artificial fertilizers or pesticides. "People want to consume foods that make them feel better," said Driscoll, a bookeeper by profession who said her health and energy level have improved since she changed her diet to include fewer processed foods and more live and organically grown vegetables. Irving, a career contractor, also swears by organics. "I’ve lost weight and I feel a lot better," he said. On the third floor of a building where workers once toiled over machinery, thousands of trays filled with plant seedlings soak up artificial sunlight from electric lights that move back and forth automatically across the ceiling. Workers patrol the 10,000 square feet of indoor garden irrigating seedlings from backpack sprayers filled with spring water. Besides growing and distributing locally grown indoor plants, IOF is working to market its concept through its soon-to-debut website and a Facebook page that will include tips and recipes and allow consumers to add their own comments. "Part of our job is to educate people," Driscoll said. Each of the three partners brings a particular piece of expertise to the indoor gardening game. Rao, a former physicial education teacher and a health consultant for professional athletes, has researched organics and healthy foods and growing methods for years, and brings a wealth of expertise in urban agriculture. Driscoll obtained business training as a bookeeper and also teaches Tai Chi at the local YMCA. Although Irving is now devoting his full-time energies to the plant business, the partners lean on his construction skills to keep things running and renovate their facilities to accommodate future business. Currently, IOF is preparing to formally launch its business by setting up booths at various farmers markets and opening its own outdoor sales area next to its 104 County St. site in May. Those who wish additional information about Indoor Organic Farm of Attleboro can visit the farm’s website at www.attleborogrows.com or its Facebook page by searching for iofattleboro. IOF can also be reached by phone at 508-455-0532.